Image via Fashion & Style by Vanja M.
I actually have an outfit post going up next week with my chambray and leopard jeans- how funny! It's the perfect casual-yet-fashionable look, IMO. I love this outfit! I think the leopard pants so so freaking awesome! I love the loose, almost pajama-y fit of those pants. They could be dressed up or down so easily! How cool is this, love how causal she wears the leopard print! Lovely outfit! :) I need that bag! :D I'm following you on facebook (petra lorencova) and bloglovin (#175), you can follow me back:) I'd really appreciate it! Kisses! I was searching for this pants such a long time!!! You totally nailed that outfit! Animal print isn't really my thing but the way it's paired with that shirt is making me rethink it. 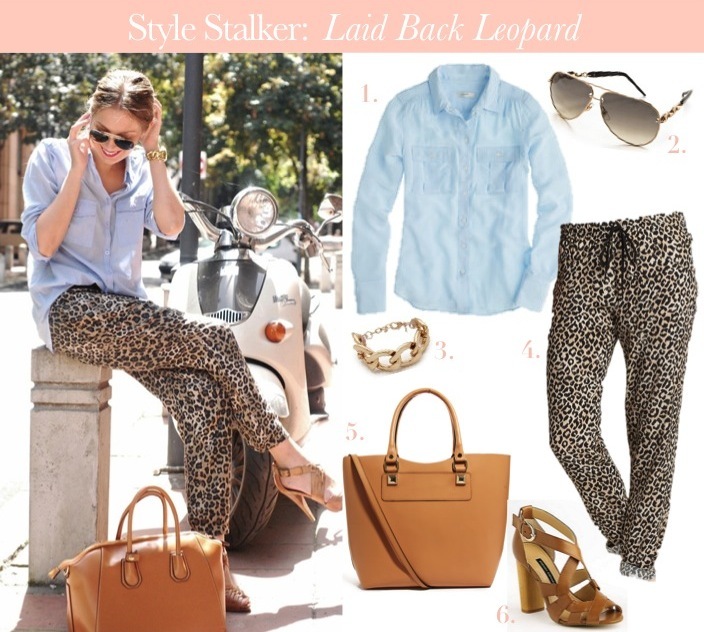 I'm totally obsessed with leopard print pants right now too!! I still haven't found the perfect ones, but I love these! I NEED those RT Leopard pants! They are phemon. The whole outfit is so my style! Love this look and how you put it together! Gorgeous!